The ever-evolving state of technology has introduced us to a tool that elevates and intensifies marketing efforts for various industries. Drones have been around for centuries, but just now are we starting to harness them for their full potential. Companies are realizing the value drones have on showcasing their product, property, facility or area, using the amazing footage and images to their advantage. Learn how drones have the capability to enhance and improve your marketing strategies. Drones, formally known as unmanned aerial vehicles (UAVs), are described as “flying robots.” Without getting into the nitty-gritty, technical inner workings of the mini-copter, they can be controlled remotely by a pilot on the ground or operated autonomously through an onboard computer, communication links and other equipment. Drones can typically stay in flight for approximately 12 minutes, with battery upgrades that can last up to 25 minutes. What’s the Big Deal with Drones? If you see video footage from the ground side by side with aerial drone footage, you can definitely notice the difference in impact. The drone’s footage will fascinate you because it provides a bird’s eye view of scenery that isn’t easily visible from the ground. Your viewers get an all-access pass to an incredible display that your company is sharing with them. 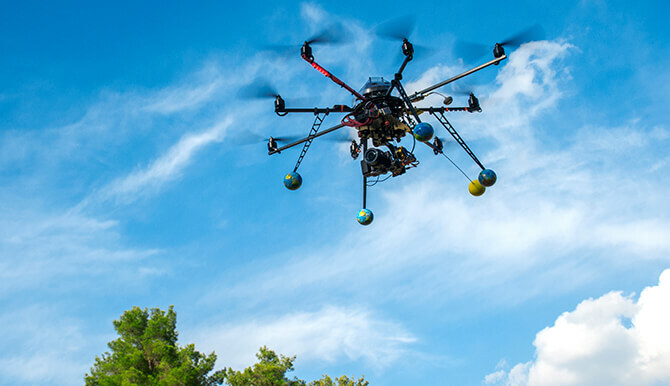 Recently, the buzz surrounding drones pertains to the legality of flying them. For commercial use, businesses must obtain three things in order to operate a drone in national airspace: a certificated and registered aircraft, a pilot’s license and operational approval. Appleton Creative only uses professional drone companies and pilots with the required certifications to fly. As of February 2, 2016, only 3,170 Section 333 Exemptions had been granted nationally for the commercial use of drones. As one of the top states with the most companies operating drones legally, Florida currently has less than 100 companies with the exemption. Drones can be used to either lead or complement your marketing campaigns. Both the drone’s video footage and still images provide dramatic aerial views that are unprecedented when compared to a regular photo or video shoot from the ground. These captivating shots add dimension and movement to your website, print materials, commercials and more, leaving an impactful and awe-inspiring impression on your audience. When it comes to drone footage and photography, you can use these powerful tools in many of your already-established marketing strategies. When you enlist the help of an experienced advertising agency that’s well-versed in video marketing, you get much more than just a drone video. Since the average Internet user spends 88% more time on a website with video, incorporating drone footage on your website would be an integral part of marketing the footage. In addition, we might recommend creating a digital campaign that includes posting the drone footage of a property, area or facility on social media channels like YouTube, Facebook and Twitter. With YouTube being the second largest search engine and the third most visited site on the web, this video-based social channel is perfect for showcasing your company’s drone footage. Add Facebook’s average daily video views that have jumped to 8 billion and Twitter’s promoted autoplay videos, and you have a creative, widespread campaign that captures attention and has the capacity to turn your followers into leads. Which Industries Can Use Drones? Commercial drone usage is spiking in a variety of industries, including agriculture, real estate, construction, news media, entertainment, film production, energy and many more. Before drones became a commercial asset, it was hard to effectively display the depth or expansiveness of the products, properties or projects that many industries need to demonstrate to audiences. Recently, Appleton Creative’s President/CEO, Diana LaRue, spoke about how drones are used in commercial real estate marketing for CREW Orlando. In her presentation, she discussed how real estate is the perfect example of an industry capitalizing on drone aerial photography and videography. Previously, realtors used helicopters to capture the gorgeous views of their properties, but drones now prove to be an affordable and accessible alternative that allows them to save money and time, in turn, being able to show more properties. In addition, you can advertise the benefits of a location, accessibility and traffic patterns in the area. While it’s a perfect example, real estate is just one industry that has been capitalizing on the commercial use of drones for marketing. Have something beautiful you need to show off? Appleton Creative is an award-winning, full-service Orlando advertising agency that specializes in video marketing, search engine optimization and social media campaigns. We work with local, national and international clients to deliver impressive ad campaigns, branding, print, web, public relations, social media and video services — all in-house. At Appleton, we want to learn about your business, empower your marketing team and be your creative resource. Your advertising goals are worth a conversation: contact us at 407-246-0092 or info@appletoncreative.com.